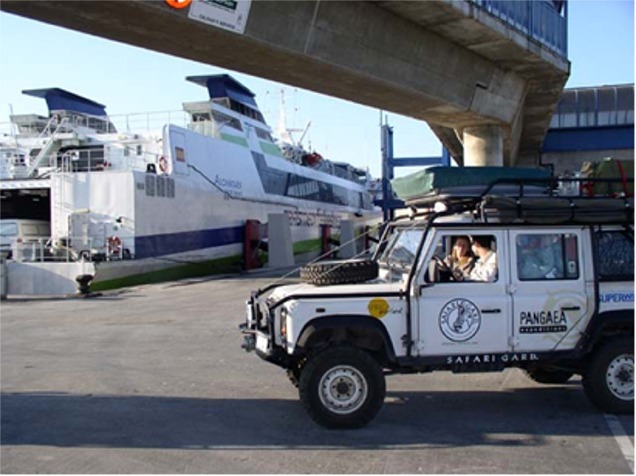 We only had about 150km to drive to reach Algeceras, the port where we would get the ferry to Morocco. We arrived there at about 11am. We got our tickets (97 euros for one car and two people) and boarded the ferry. The crossing took only about an hour and before we knew it we were in Africa! Officially, though, we were still in Spain, as Spain retains a couple of footholds in northern Morocco. We were in Cueta (pronounced Soota), which is quite attractive. The weather was beautiful and the sea was a deep blue. 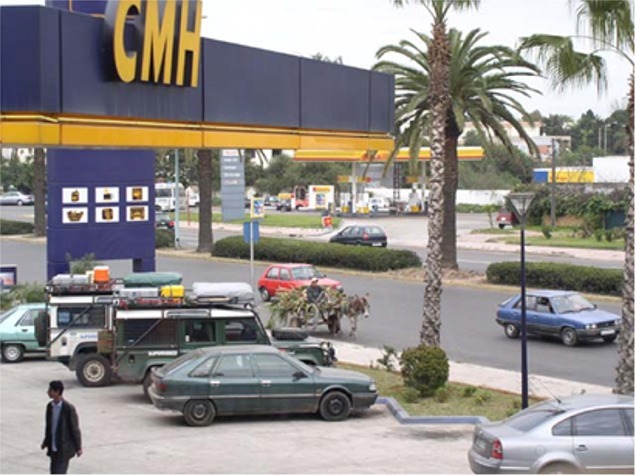 Cueta does not charge tax, and we were able to fill our tanks (and jerry cans) for .47 euros per liter. We then went to the border to officially enter Morocco. The process involved several “helpers” (they must have been paid, as they didn’t ask for any money) and took about an hour. The search of our vehicles was cursory. We drove another 40kms to a campground on the coast near the town of Tatuon. Apparently some scenes from Star Wars were filmed near here, and we suspect that this is where Tatouine got it’s name. We came across people wearing brown robes with pointy hoods. They looked startlingly like Jawas… Once in camp, we went for a walk along the beach. We met a Spanish family who live in Cueta and were spending the weekend at the campground. We talked with them for a couple of hours. We drove across to the Atlantic side of Morocco in the morning on our way to Casablanca. The climate seemed much wetter than we had expected, and once we left the Mediterranean coast it became cloudy. 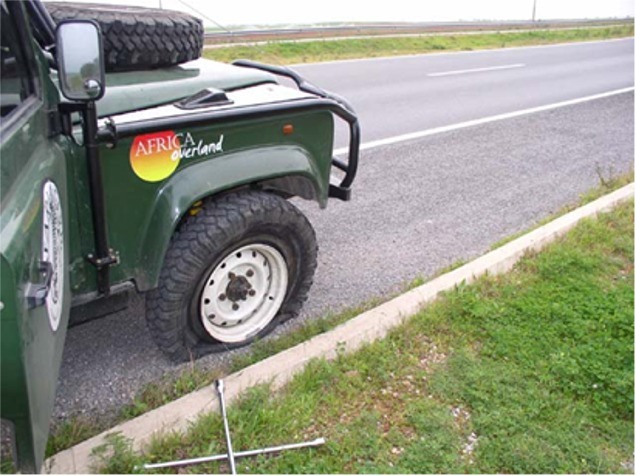 The right front tire on the green truck blew out on the autoroute and within minutes of beginning the tire changing operation, a guy appeared from out of nowhere to provide “help.” He was well-meaning, but unneeded. We changed the tire and drove on, giving the guy a few dihram. We arrived in Casablanca at 3pm, and unable to find the campground recommended by lonely planet, we drove south along the coast. We found one closed campground, and another that looked more like a rubbish heap than a campground. Eventually we stopped for dinner at one of the many empty coastal restaurants. The told us what was available, and they went out for groceries. After a long wait, we were served an excellent meal of salad, fried fish, lamb kebabs, and potatoes. We asked about hotels, and guide went across the street and introduced us to a guy who rents “Cabinas” during the tourist season. We decided to stay there for lack of anything better or cheaper. Tomorrow we will go into Casablanca to get our visa for Mauritania and hopefully Mali. We awoke early and drove into Cassablanca, using GPS coordinates to home in on the Mauritanian Embassy. We submitted our paperwork and Witt went off to try to get our tire repaired while we waited for the visa to be issued. The sidewall of the tire had been destroyed and was a write off. I met a man named Amine, the owner of a medium sized local business, at the repair shop who offered to help me get a new tire. To make a (very) long story short, Amine spent virtually the entire day with me trying to find a suitable replacement tire. After looking at many tires, I finally purchased a well-used Michellin XC for $35. At this point we had received our visas and we were so tired of Casablanca that we left at dusk to drive the 60km to Settat. Amine was very interesting. He was well dressed, spoke excellent English, and drove an Audi. He was always on his cell phone conducting business, and missed a client meeting while helping me find a tire. I asked him why he was spending so much time helping me, and he told me that the Koran says that there are three groups of people you must take care of. Your parents, friends and family, and travelers (or people who know no one). In the end, he spent most of his day helping me. He also had employees running around the city searching for tires. I have seldom encountered such generosity directed toward a complete stranger. We drove from Settat to Marrakech today, arriving at the campground at about 11am. We plan to stay here for a couple of days, as this is the last place we will find a supermarket, so we will need to plan our route from here and stock up on food. While preparing lunch, the tire that took so much effort to acquire yesterday spontaneously blew up with a very loud bang. So now we are once again down to one spare tire on the green truck. In a last ditch effort to correct the continuing shudder in the steering, witt had all four wheels balanced. This seems to have corrected the problem. We met a French couple in camp who have just spent a month in Mali. They gave us some excellent travel advice and showed us their route on a map. Their help will be invaluable. For dinner we accompanied them into town to visit the market (souk). There are over a hundred food vendors there selling all manner of amazing food. It was a feast for the senses. We ate at a couple of different stalls. The food was prepared in front of us and was very cheap (all six of us ate for 130 dihrams, or about $15). Note that for those of you who think we are completely nuts, we met another French couple on their way to South Africa (in a Pinzgauer) in camp. She is pregnant and due in about a week. They are staying in Marrakech until the baby arrives, then they will continue on with their trip. This shop sells dried dates, pistachios, etc. Oh! Oh! Mon amee! You eat here! Number forty two! is the best! We spent the morning in camp washing clothes, doing minor adjustments to the vehicle, and making a run to the supermarket for more food. We also talked extensively with the Frenchman who was recently in Mali. He gave us about a dozen maps of the region, which we photocopied in Marrakech. 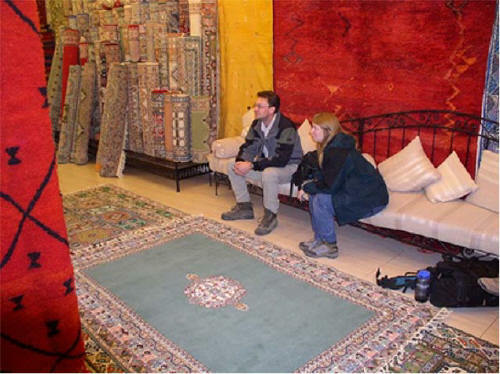 We spent the afternoon in town, with Graham and Connie buying a carpet, and Jen and Witt buying inexpensive travel rings to replace the wedding rings we left at home. At least we now feel like we’re married again! In the evening we ate in the market again (it’s cheaper than buying food) and spent some time at the internet café. Connie had plenty of time to watch the cockroach crawl across her computer table while internet pages crawled across her computer.